Total Drama Island is a Canadian animated parody of the popular reality TV show Survivor, in which people are eliminated based on challenges until there is one winner. I just can’t help thinking about that cartoon when I see Trinidad & Tobago politics in action! As an outsider, an expatriate, it is with detached amusement that I’m able to survey the political landscape of this twin-island republic without blowing a gasket, as most locals probably have! Trinidad & Tobago has it all. Unlike most Caribbean islands, there aren’t simply two political parties anymore — there are three, four, five and counting! Rather than create more choice, this setup has created more confusion and bacchanal. There are two traditional main parties, the United National Congress (UNC) and the People’s National Movement (PNM). 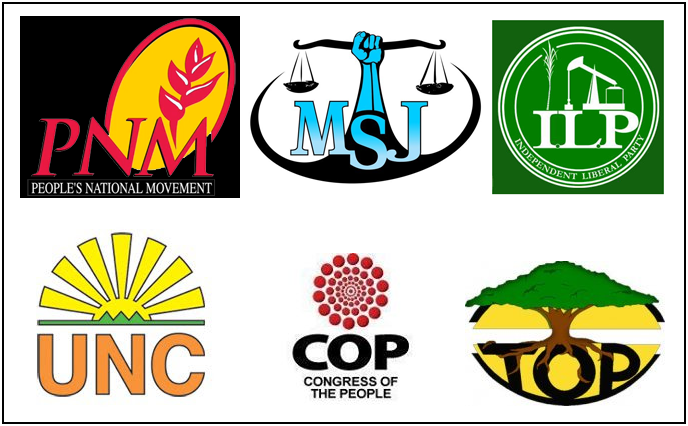 In the past seven years since I’ve lived here, a few others have been added to the cocktail with spectacular results: the Congress of the People (COP) formed in 2006, the Tobago Organization of the People (TOP) in 2008 and the Movement for Social Justice (MSJ) in 2010. The Independent Liberal Party (ILP) formed most recently, in 2013, and there have even been a few upstarts, such as the National Coalition for Transformation (NCT), Democratic National Assembly (DNA) and the hilariously named, one-man Party for Integrity and Morality in Politics (PIMP). Now let me give you a “little” background. When I first came to T&T back in 1999, the UNC was in power under the charismatic and wily Basdeo Panday as Prime Minister. His government collapsed amid a slew of allegations of corruption revolving around secret apartments and finances in London and mismanaged airport building funds, and he was promptly replaced in 2003 by the Patrick Manning-led PNM. The PNM then “gave up the ghost” in 2010 after two terms, in what most consider a blunder by Manning to call snap elections. They were swept out in a wave of outrage at what most Trinidadians felt was corruption of a different sort — one of power — by Manning. To most, he had begun to think of himself as untouchable: he did what he wanted, when and where he wanted. During Manning’s fall from grace, there was a revolution within the PNM being led by current Opposition Leader Dr. Keith Rowley, who began to publicly separate himself from what was an increasingly sinking ship. While this power struggle was going on in government, Panday, the man who started all the drama, was also being deposed as the leader of the party he founded. This coup d’état was led by his own right-hand woman, current Prime Minister Kamla Persad-Bissessar, and her partner-in-revolution and major UNC financier Austin “Jack” Warner, who now just happens to be founder and leader of the newly formed breakaway ILP. See how complicated things are around here? The UNC, hand-in-hand with the young COP and the newly formed MSJ, went into office under the umbrella of the People’s Partnership (PP) coalition on a bed of roses and promises, few of which the people of Trinidad & Tobago have seen come true. As a matter of fact, since day one there has been scandal after scandal and faux pas after faux pas. From the “No free help” statements to CARICOM islands hit by Hurricane Tomas to the Section 34 scandal, Debe highway protests and limited success of the laptops for SEA passes programme, it has seemed to many onlookers that the current government has been on an expensive three-year publicity campaign with few results. The PP has steadily disintegrated since its inception, with the MSJ moving out, the loss of union support that helped carry them into office and the recent separation from the internationally maligned Warner. One of the chief architects of the PP, Warner was slowly demoted and distanced from power in the party as his image became more and more tainted — a process that has taken too long in the eyes of most. Now having formed his own party (the ILP) he is a constant thorn in the side of the his onetime colleagues, retaining his parliamentary seat in a recent by-election. Recent local government elections held on Oct. 21, 2013, showed that the people are once again looking to the other side of what may be a two-headed coin, with little hope for much change but a strong desire to make a statement to the current powers that be. As seems to be the trend lately, people are voting out parties rather than voting them in. The turnout for this week’s local government elections in T&T was only 38%, but the message was clear, with the PNM winning eight of the 12 regional corporations up for grabs, the UNC winning four and the Warner-backed ILP empty-handed but splitting votes significantly. Trinidadians are tired of the bacchanal of the People’s Partnership and want change, even if it’s one devil for another. With a by-election for the now vacant St. Joseph parliament seat coming up in under three weeks after the resignation of former UNC MP Herbert Volney currently batting for the ILP, the main casualty of the Section 34 scandal, the polls will once again tell whether or not the next episode of Trini Drama Island will be a hit for the various players involved!